Several days ago the Bethlehem Light of Peace, which began its worldwide journey on November 26 from the Grotto of the Church of the Nativity in Bethlehem, arrived in Detroit. In accordance with a 28-year tradition, the Light of Peace was first carried to Vienna. There the flame was passed to scouts who had arrived from many countries, including Poland and America. This year’s theme in sharing the Light of Peace is “Emerge from the shadow. Demonstrate goodness.” The flame arrived in New York on December 5. From there it was transported to other cities, including Chicago where it was brought by a member of the Boy Scouts of America. 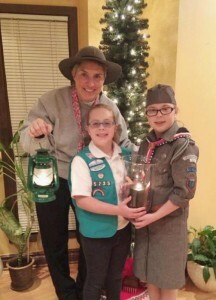 On Monday, December 9 Teresa Wiącek, an instructor with the Polish girl scouts in Detroit, rendezvoused near the Michigan-Indiana border with a Beata Pawlikowska, a Polish scouting instructor from Chicago, from whom she received the light. Returning to Detroit, she visited the home of Waldemar and Annette Raczkowski, whose daughters, Victoria and Caroline (photo), then delivered the Light of Peace with their parents to St. Fabian Parish in Farmington Hills. On Wednesday, December 11, Teresa brought the lantern bearing the Light of Peace to the pre-Christmas gathering of the Amber Circle at the American Polish Cultural Center in Troy. Candles lit from the lantern were place on the tables during dinner and before leaving several persons lit their own lamps in order to take the light from Bethlehem home with them. The Bethlehem Light of Peace continues to brighten the Detroit area. In addition to St. Fabian Parish, the light arrived in Hamtramck’s St. Florian Parish on December 12, and on Saturday, December 14, during the Polish scouts’ Santa Claus gathering, the light was delivered to the parish of Our Lady of Czestochowa in Sterling Heights.